I was delighted to see our personalised cotton party bags listed in an eco party bags feature in The Green Familia last week. The Green Familia is a must for all shoppers concerned with the environment, full of recommendations for, and information on environmentally friendly and organic products, so well worth a visit. 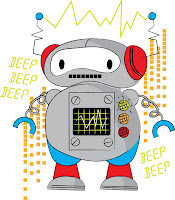 I'll soon be increasing our personalised party range with this fantastic new robot design, as well as seasonal themed bags for Easter and the Football World Cup, so watch this space! Party bags dropshipping service now available!